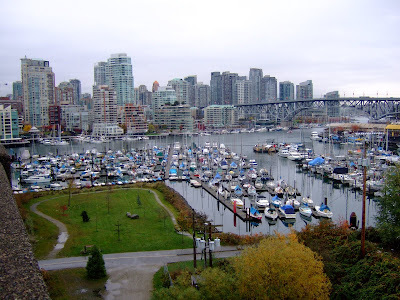 I had a nice weekend in Vancouver. Despite the fact that it's always a few degrees colder and a little more wet than Seattle, it's got a vibrancy and movement that Seattle never seems to match. I didn't visit any fabric/sewing stores. I did, though, pop into a magazine shop (whose name I don't recall) that I happened to walk by on West 4th in Kitsilano to check out their sewing magazine selection. I saw both September and October BWOFs available, but no other European pattern magazines, like Marfy, Patrones, etc. I've noticed other bloggers have started thinking about holiday dresses. Me too! Specifically a dress for New Years Eve. 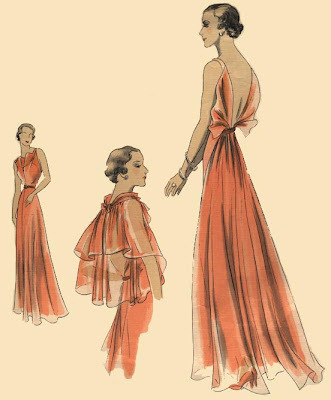 I'm leaning towards doing a 1930s or 1940's style gown. Butterick just reissued a style that I'm really digging, B5136. I'm not sure about the backwards shrug, but I love the one-shoulder dress, and it's supposed to be easy to sew, which is what I want if I'm going to be dealing with slippery fabric like charmeuse. 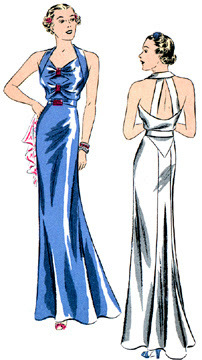 This pattern is available at the Vintage Pattern Lending Library, it's T1602, 1930 evening gown with back bands. I like the look of the two bands in the back, and the pointed skirt yoke in back is a beautiful art deco touch. The front of the bodice is "held with clips." Anyone know what kind of clips those would be? This 1930's pattern from Eva Dress, style 371, is drop dead gorgeous! It has an inverted pleat at the center front of the bodice, and "the low back decolletage is framed with two wing-shaped jabots." Jabots?! I've never worn jabots before! And the sheer cape.... sigh.... Unfortunately I think this would be too big of a project for me to tackle at this time. I'm envisioning at least 2 muslins and a fair amount of fussing to get the CF pleat and jabots to fall nicely. Anyone know when the next Butterick sale will be? Those dresses are beautiful! We don't dress up here (Australia). Maybe because it is summer and we are more likely to be at a casual function - eg bbq. I do like that Butterick reissue and I saw the Eva dress when I started looking. All three are beautiful. clips are just that --- you can usually find vintage versions in antique shops. Beautiful dresses! I can really envision you in the first, you would look fantastic in it. Not that the other 2 aren't great, far from it, but - I could just see you in that first one. This is going to be fun! Butterick is on sale starting tomorrow at Hancock fabrics for $.99 - is there one up there? If not, Joann's is supposed to price match the ad (if you get it). I tried it two weeks ago when they were on sale and it worked at my Joann's. What are you doing on New Year's Eve that you could wear those to? Sounds fun - I want to go!! All those dresses are beautiful! No matter what you make, you can't go wrong. Oh, and I almost forgot: the Carr book is Couture; the art of fine sewing by Roberta Carr. It has the most ghastly pictures of clothes from the 80s, and she'll drive you crazy with her breathless references to "the couture," but it's got loads of good information that you can't find elsewhere, especially for working on the bias. And the bow--almost a throw away mention of that in the book, but you never know when you might need something like that. Look for the book used; it's much cheaper that way. oh dear! Thanks for the link to the vintage pattern lending library. I had no idea. I love your gown choices. Butterick and Mccalls patterns are $0.99 until Monday 12th. Cheers. They're all gorgeous but I especially love that last one. The floaty capelet is divine. these are really gorgeous dresses! the third is my favorite, i completely agree with the envy of the cape. All three dresses are stunning, but in my opinion the third vastly outshines the first two.